The first time I encountered the art of David Huffman, it was an awakening of sorts, not least because the artist has consistently and remarkably managed to combine a range of contradictory elements: everything from racial consciousness and the aesthetics of science fiction, to the visual idioms of abstraction. While Huffman’s paintings, sculptures and conceptual projects interrogate the politics of race, it is the dexterity with which he negotiates the slippages between representation and abstraction that defines the extraordinary character of his formal acuity. Raised in Oakland, California, by a mother who was an artist for the Black Panther Party, Huffman displays a consciousness of the potentialities of visual expression that is evident in his every brushstroke. His early paintings, often populated with minstrel figures set against expressionist backgrounds, left an indelible impression upon me. But it wasn’t the stereotype that stuck; rather, it was the melding of Abstract Expressionism’s grand gestures with the stark and disturbing frankness of the raced body. Huffman’s ability to adeptly merge abstraction and figuration has continually fascinated me — if for no other reason than that I have always been aware that the mythical universalism of abstraction is often meant to signify emancipation from the politics of identity. 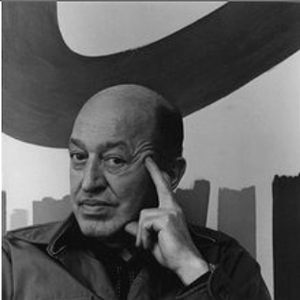 Clement Greenberg, the late critic and champion of Abstract Expressionism, often spoke passionately about the liberating potential of nonobjective art as if it were meant to deliver us from the evils of ethnic essentialism and nationalism. Even today, art historians muse nostalgically about the utopian 1950s heyday of high Modernism and the New York School — a moment when gender and racial inequality reigned supreme. Are we to believe that, through all those violent brushstrokes and drips, the political dimension and messiness of human existence were somehow evaded? Greenberg’s obsession with the plight of postwar American Jews informed his aesthetic theories and paved the way for an eventual advocacy of the abstract gesture as a metaphor for assimilation and the universal. Huffman’s artwork stings precisely because it makes us aware that the desire to liberate ourselves from the clutches of race is so often connected to the escapist pleasures of abstraction. Huffman mines this association through his spare but potent iconography, which has evolved across several major bodies of work. 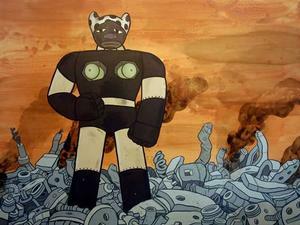 The artist’s mixed-media painting Trauma Eve 2 (2003) depicts his now infamous hybrid “traumabot,” part blackface mammy, part futuristic robotic warrior. Trauma Eve is set against a murky dystopic backdrop in a postapocalyptic future. With a melancholic look on her face and her right hand clenched into a fist, she stands defiantly in the wreckage of the lifeless, mechanical detritus of defeated combatants. Huffman’s trauma-figures are allegorical signatures for the artist. Trauma Eve, in particular, is Aunt Jemima in full-on blackface minstrel mode, replete with head rag and sorrowful gaze. But in the place of breasts, rockets threateningly jet out in armed position. We have seen this archetype before, most notably in the assemblages of Betye Saar, but Huffman’s Eve is not merely an oppositional figure plucked from the nether regions of history. Rather she is a symbol for a particular type of rebelliousness that carries the burden of an embattled past and fights against a history of violence and oppression (albeit one that dares to envision the possibility of blackness in the future). Huffman’s production bears an uneasy relationship to the ennobled history of black American art, even while his work seems to so often transcend the limitations imposed by categorization. His otherworldly universe, inhabited by “traumanauts” and UFOs, has broken from the aesthetic and conceptual concerns of past expressions of African-American art — even as the signifiers of blackness remain ever-present. Huffman’s densely iconographic and allegorical paintings take on unexpected forms that are decidedly satirical in both their uncanny engagement with the political dimensions of the African American experience and in their use of the visual language of formalism. 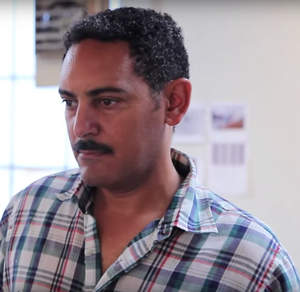 In many respects, “black art” is simply too narrow a category for Huffman’s art. In its self-conscious futurism, the artist’s oeuvre exudes a genre-defying restlessness—a desire to transcend the limits of our expectations and demands, while gesturing towards the unexpected. Huffman is an adept antagonist and provocateur, and his work imaginatively evades easy categorization. To encounter a Huffman painting is to experience a restless and formidable intellectualism that utilizes often-controversial images but that defies our attempts to easily render them legible. That said, I wouldn’t consider Huffman an “issues”-oriented artist, per se; rather, he occupies a creative and intellectual niche in which he refuses to neglect content for the sake of formalism. But perhaps it’s more comforting to think of Huffman’s artwork as a gateway into a black unconscious — or as a safe vantage point from which to comfortably excavate the painful complexities of America’s difficult past. Earth Blues (in prayer for the rejection of the anti-lynching bills) is a mixed-media work on paper that continues the artist’s complex interweaving of formalism and narrative representation. The formal backdrop is pure abstraction: a murky outer space, rendered beautifully in complex tonal washes of black and gray, with watercolor splashes of light and glitter that enhance the composition’s otherworldly feel. It is virtually impossible to escape its references to Chinese landscape painting and Abstract Expressionism, but Huffman jolts us out of our escapism by overlaying a lynching scene on the surface of this masterfully executed psychedelic cosmos. A meticulously rendered tree floats idly in space. 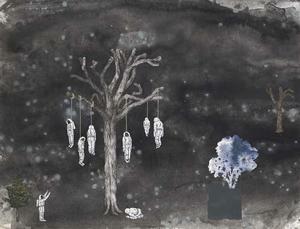 It appears dead and barren except for the strange fruit that dangles from its twisted branches: six traumanaut figures with nooses around their necks lifelessly hang. 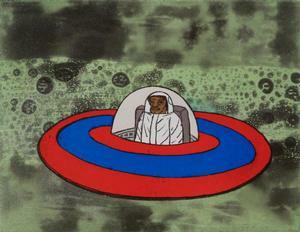 Huffman’s traumanauts are brown- and black-faced astronauts who always don white spacesuits. These humanlike forms are playful in their cartoonlike rendering, but they are in fact a powerful symbol for cultural homelessness, discovery, and the plight of black folks as they find their way in the wake of an embattled past and amidst an uncertain future. Huffman seems acutely aware that, within the milieu of contemporary art, the black body represents a problem of sorts. It has become so ideologically over-determined as a form of social symbolism, that it is often overly burdened with the expectation to entertain viewers. In his most recent paintings — a stark contrast to earlier bodies of work — formalist abstraction has taken over the more overt allusions and iconoclastic usage of racialized bodies. But while Huffman has abandoned the physical form, representation still pervades, albeit in an understated and graceful iconographic engagement with the basketball. The recent paintings are remarkable, not just for their formal elegance, but also for their incredibly subtle usage of a symbol that contains so much ideological weight. The basketball holds both real and metaphorical significance in the lives of black people, but it has also been an enduring trope in African American art, from the conceptual efforts of David Hammons, Marlon Forrester, and Mark Bradford to the politically charged paintings of Michael Ray Charles. 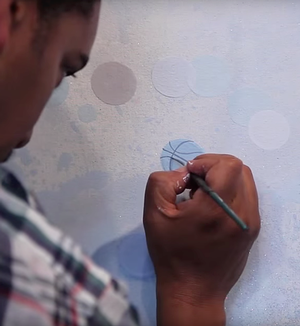 But Huffman’s B-ball abstractions have a subtlety and refinement that is stunning to behold. Considering the trajectory of his symbology, it is notable that Huffman’s sociopolitical concerns and issues around identity have been synthesized into the basketball icon. Having witnessed the evolution of his iconography, I notice a stillness and maturity in this work that is quite stirring, and the basketball (perhaps even more than watermelons, minstrels, or traumabots) becomes a cipher through which to ponder the struggles and victories of black uplift. Despite the absence of the physical form in Double Jump, the large painting is unmistakably a Huffman in its formal distinctiveness. 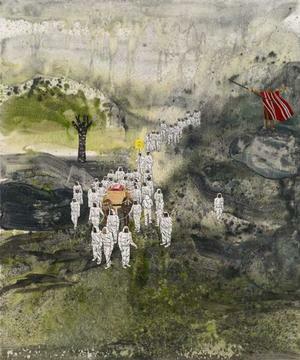 It recalls the murky counter-universe of earlier works, the nod to science fiction and the dense layering of various mediums that create a very unique visual and textual vocabulary. 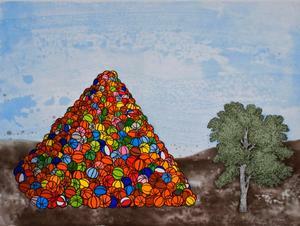 What stands out most powerfully, is Huffman’s use of the basketball, an icon presented here as a kind of hieroglyph. In some sections, the black stenciled images rest interlocked—and in neat rows like words on a page. At other times, they seem to fade into the background, or they’re interspersed in dense conglomerations that almost seem to move throughout the canvas. Some of the basketballs are in odd colors: pink, white, light blues and greens, yet they form a playful, albeit ideologically potent marker for complex social issues. The basketball figures into Double Jump in ever more subtle ways as well. One of the more indiscernible textural elements in these recent abstractions in the artist’s use of basketball netting which he utilizes as a stencil. 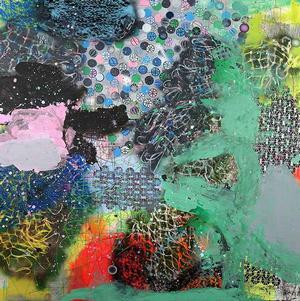 Using spray paint to apply color, Huffman has created a jumbled, beautiful effect that is as unusual as it is unexpected. In a smaller, more recent work, Berkeley (2016), the basketball net takes over the composition creating a dense layering effect. The blue and purple netting rests atop a stark black background, creating a fluid, perilous-looking space. 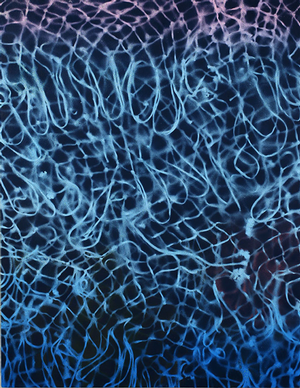 Although the darkness of the void appears cavernous, it is in tension with the forbidding, claustrophobic surface pattern—as if the viewer is already entangled. 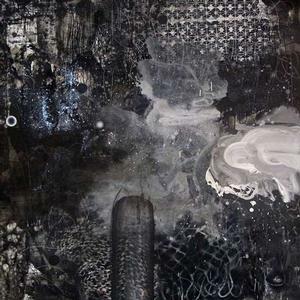 Dark Logic (2015), another large mixed media work on canvas, combines all of the elements characteristic of his recent abstractions, although this work is rendered in stark blacks and grays. The vibrant color arrangements, so emblematic of Huffman’s oeuvre, have given way to a monochromatic palette — yet the effect is no less complex. The basketballs, the netting, the tempestuous space-like formations are all present, yet what stands out most powerfully is the work’s concentrated blackness: a formal element so loaded, it overwhelms the more direct allusions produced by Huffman’s symbolism. The blackness of Dark Logic is both foreboding and melancholic, while also exuding defiance. Dark Logic functions as the perfect bookend for other less subtle works in this period, for example, the large-scale abstraction entitled I Can’t Breathe 4 (2015), a chaotic and angry ode to the spate of police shootings of unarmed black men in the U.S. The painting’s title is a direct reference to the final labored words spoken by Eric Garner, the African American man choked to death by the New York City Police Department on July 17, 2014. In the wake of Garner’s murder, the phrase “I Can’t Breathe,” became a mantra of sorts as well a rallying call in activist efforts to stem the tide of anti-black violence. Huffman’s masterpiece utilizes these words to stunning effect, both formally, as well as for their polemical affect. Layered throughout the composition, the words “I Can’t Breathe” flow throughout with a kind of subtle violence. At times upside down, or presented backwards, the phrase floats through the painting like a wave: wreaking its havoc, only to dissipate and fade into the background. Dark Logic elicits similar feelings, yet it does so in its metaphorical usage of color. It is clear that Huffman has a lot on his mind — in fact, much more perhaps than what the pleasures of formalist abstraction might initially suggest. He has managed to deftly combine political sentiment with abstract formal gestures in a manner that pushes African American art into new terrain. Ultimately, the brilliance of Huffman’s work is that it claims the agency to envision black life as a beautiful abstraction with limitless possibilities. Derek Conrad Murray, Ph.D., is associate professor of history of art and visual culture, University of California, Santa Cruz. His numerous publications include the recently published book, Queering Post-Black Art: Artists Transforming African-American Identity After Civil Rights.